A 6.3 Magnitdue Aftershock Struck Oacaco, Mexico. | Chaos Sweeps Away the World We Know! The Disaster, current events & Catastrophe Blog. Forecasts for 2014 to 2022. Read tomorrows news today! Plus current economic, commodities, stock indices and financial news. 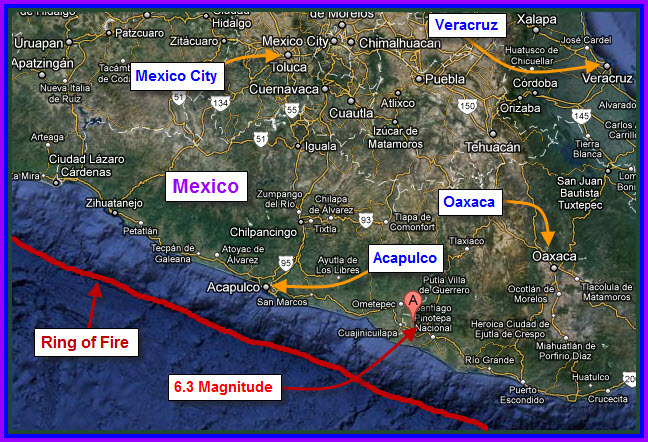 April 2, 2012 – A 6.3 Earthquake Stuck Oaxaca, Mexico: Today’s tremor was an after shock to the 7.4 magnitude quake that struck in the same region on March 20, 2012 that killed one and injured six. The quake occurred at 12:36PM and flushed office workers outside in Mexico City (pictured above) and rattled tourists in Acapulco. It was 1:36PM in New York, 12:36PM in Chicago (and at the epicenter), 11:36AM in Denver and 10:36AM in Los Angeles. Pictured above is a Hazards Map from the USGS. Clearly the western coast of Mexico is prone to powerful earthquakes. Todays quake is marked by a star on both the Mexican and World maps. The tremor was 99 miles SSW of Huajuapan, Oaxaca, Mexico; 108 miles southeast of Chilpancingo, 108 miles ESE of Acapulco and 210 miles SSE of Mexico City. Of the 352 earthquakes greater than or equal to 7.0 magnitude, occurring between 1/1/1973 and 4/2/2012, the country of Mexico was tied for 6th on the list. First was Indonesia with an astounding 45, follow by Japan (27), Russia – mostly in the far eastern Kuril Island Chain (25), the United States (21) and tied for 6th with 16 were the Solomon Islands, Chile, Mexico and Papua New Guinea. The March 20, 2012 Mexican quake killed one and injured six; the April 4, 2010 tremor killed two and injured 233; while the January 22, 2003 trembler killed 29, injured 300, destroyed 2,000 houses and damaged another 6,600. This entry was posted in Chile, Death, Earthquake, Events, Japan, Mexico, Misc, Miscellaneous, Nature, News, Papua New Guinea, Papua New Guinea, Russia, The Ring of Fire, The Sandwich Islands, United States and tagged 2012 7.4 quake which killed one and injured six, a 6.3 magnitude oaxaco mexico on april 2 2012 - which was an aafter schook of the March 20m, The Master of Disaster. Bookmark the permalink.